BMSB is about ½-inch long, with marbled-brown coloration. BMSB looks similar to some of the native stink bug species, but can be distinguished by the light-colored bands on the antennae and the alternating dark-light pattern on the edge of the abdomen. In addition, the veins of the membranous parts of the front wings of BMSB are outlined in black, but this can be difficult to see. As populations of BMSB increase in Minnesota, it may become more frequently encountered in crops. BMSB feeds on many species of plants, including soybean, corn and a diversity of fruits and vegetables. Recent research by our team has confirmed that maturity groups of soybean grown in Minnesota are susceptible to feeding injury by BMSB and that this injury can results in reductions in soybean yield and seed quality, and delayed plant maturity. Scouting recommendations for BMSB are to use sweep-net sampling during pod and seed development of soybean. 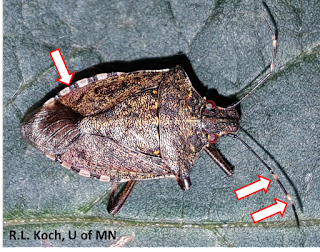 The abundance of stink bugs is often greater on field edges, so scouting should include locations on field edges and the interior. Treatment decisions should be based on the combined counts of stink bug nymphs and adults in the sweep samples. Thresholds for treatment are 10 bugs per 25 sweeps for soybean grown for grain, and 5 bugs per 25 sweeps for soybean grown for seed. 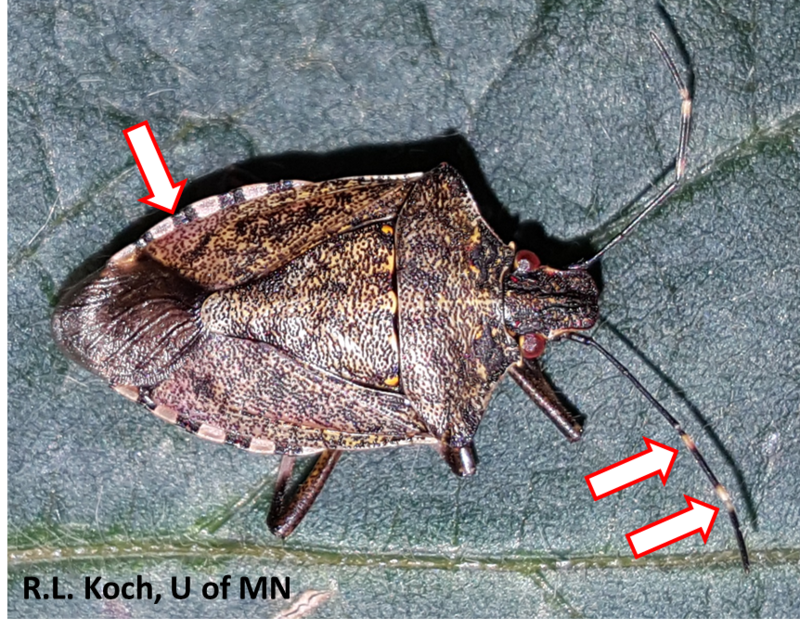 Again, we are not aware of any fields with stink bug densities near treatable levels. BMSB was first detected in the United States in the mid-1990’s and now occurs in more than 40 states. In Minnesota, BMSB has been detected as a household invader (much like boxelder bugs and Asian lady bugs) dating back to 2010. The distribution of BMSB in Minnesota can be found on the MDA’s BMSB webpage.